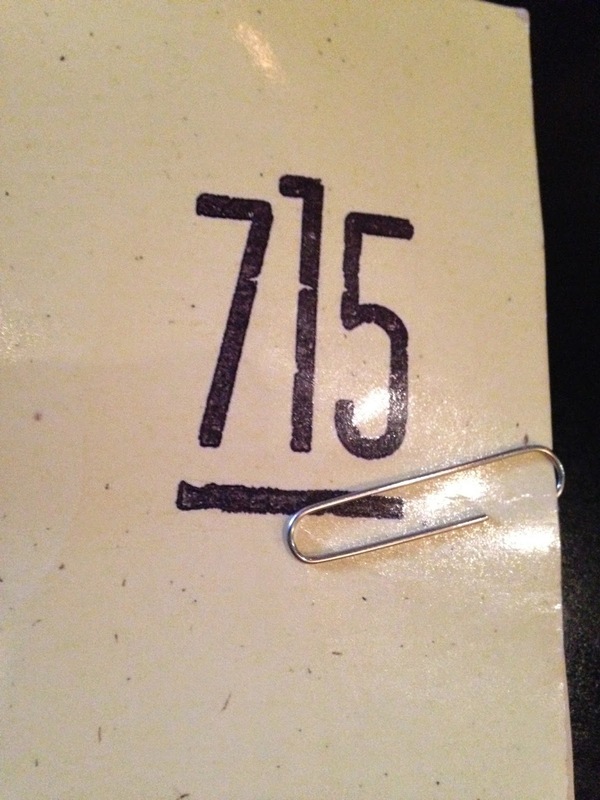 I first heard about 715 from one of their former employees and chef, Jake Dodds Sloan, a friend of my son I met at a high-end resort deep in Denali National Park a couple years back. Since then, we moved to Lawrence and I have read numerous glowing reviews on Yelp and elsewhere about this Massachusetts Street institution, so we had to give it a try. One of the reasons I avoided 715 this long was the decor, modern with sharp edges, steel, rock, and dark wood, uninviting in my eyes as I tend to gravitate toward a more traditional, classic look based on the cuisine being experienced. The waiter never told us his name or at least I did not hear it over the noisy patrons, another American tradition I do not cherish. The service was attentive and our food arrived in a timely manner, allowing us to savor our antipasti before the primi arrived. 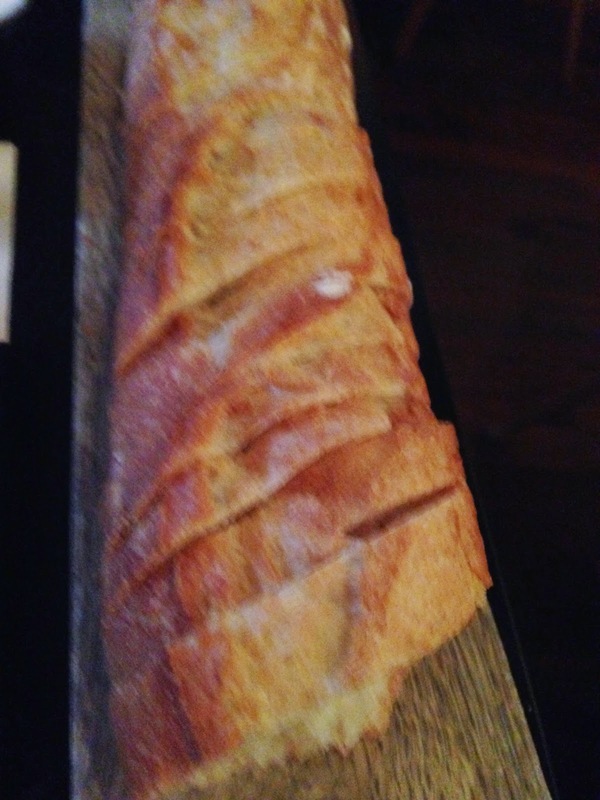 We ordered the "heritage pork" meatballs (5 for $8) and half a Wheatfield's baguette as it was apparent that no bread would be accompanying our appetizers or meal, a definite fopaux in my eyes. The meatballs were tasty, medium in size and smothered in what they call "marinara", seemingly canned tomatoes with alarmingly little seasoning and another disappointment I would experience again when my bucatini arrived shortly thereafter. The Bucatini all' Amatriciana ($17) was described as "rich pork guanciale [cured pork cheeks], caramelized red onion, spicy chiles, san marzano sauce, and parmigiano reggiano". 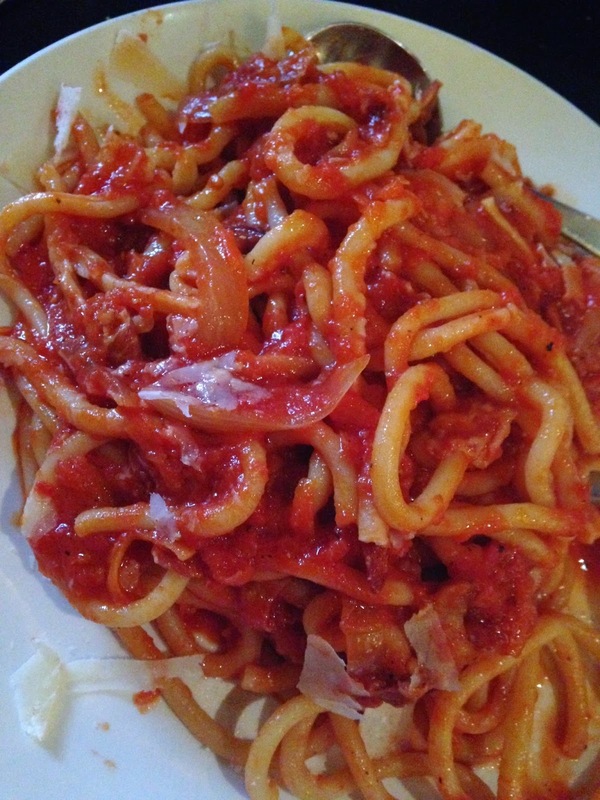 Traditionally, amatriciana is made with pancetta (Italian bacon) and sautéed white onion, lightly basting the pasta with definite evidence of both ingredients on the palate. My bucatini, thick tubes of pasta resembling oversized spaghetti, was more than al dente, it was undercooked, chewy, and lukewarm. The pasta was smothered, not lightly tossed, with what appeared to be the same tomatoes we had on the meatballs, again overly acidic with little seasoning (garlic, olive oil, salt), chunks of tomato pulp, and no sign of either the cured pork or onions that make the dish one of my favorites. I had to ask for more cheese, but by the time the paltry little dish with a smattering of shaved parmigiano arrived the pasta was cold and even harder than when it arrived, so I decided to finish my wife's Asian spaghetti and take the bucatini home where I could season it properly. My wife was going to order the spinach and ricotta ravioli, but at $15 for just five (5) and $23 for ten (10), it didn't seem like a very good value. 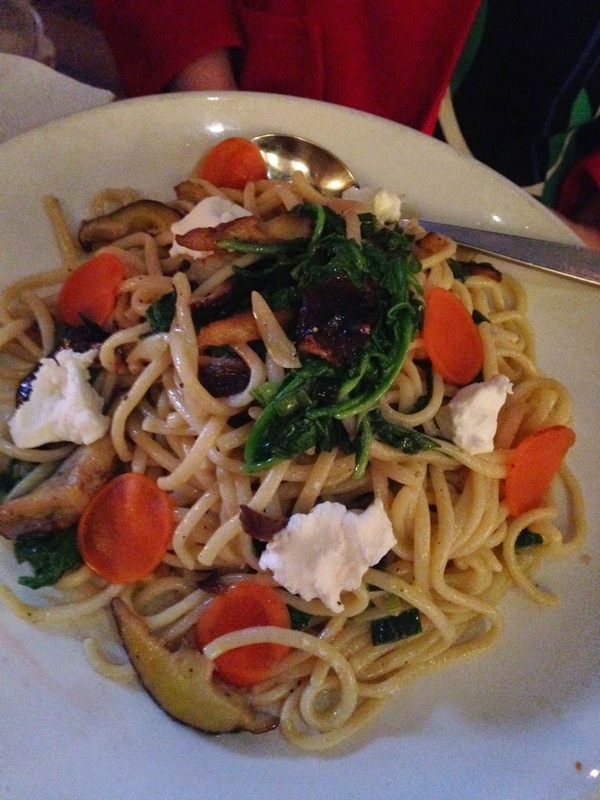 Instead she ordered the Shiltake Spaghetti, a blend of Shitake mushrooms, spinach, carrots, olive oil, and garlic with chunks of mozzarella tossed in. Untraditional in every sense of the word, the dish actually had much more flavor than my Bucatini all' Amatriciana, a favorite when I lived in Italy and ate real pasta. Italians love their pasta and she enjoyed hers, noting just a bit too much olive oil. My ratings are based on "value", taking into account the entire experience including the quality of the food, ambiance, service, and price ... the entire culinary experience. I have had far better meals for much less (in Italy) and more (see my review of Nonna in Puerto Rico), so price is but one factor. Based on my experience at 715, prices in the range of $10 to $13 would be more appropriate for the pasta dishes, $5 to $6 for the meatballs, and NO CHARGE for the bread would earn an extra bomb or two, but for an 8 to 10 bomb experience they would need to train their chefs in proper Italian culinary techniques, including how to cook pasta, season the sauces, and NOT drown the pasta in excess sauce. I was going to give them 5 bombs, but decided to add one additional for "effort" as they apparently make the pasta in-house, a rarity these days and something which should be rewarded. CombatCritic Gives 715 6 Bombs Out of 10 ... LE BOMBE SONO BUONE!